This tart is so elegant and simple that people may not believe how little time it takes to make. Store-bought puff pastry is the key: look for it in the frozen food section and let it defrost in the fridge overnight for the best results (if you forget to defrost it the day before, just leave it on the kitchen counter and it will be good to use within 2 hours). While the dramatic effect of asparagus spears laid side-by-side facing the same direction cannot be denied, when you go to cut and serve it, some people will get all ends and others will get all asparagus tips... it seems potentially rife with conflicts. Best to play it even and alternate how you arrange each spear. Defrost the puff pastry and roll out. Lay into a 12-inch square tart pan or simply form a 12-inch square on a baking sheet. Poke all over with a fork -- this technique is known as docking -- and bake until golden, about 20 minutes. While the pastry cooks, peel and finely chop the shallot. Melt the butter in a small frying pan over medium heat. Add the shallot and cook, stirring frequently, until softened and starting to brown, about 10 minutes. Meanwhile, cut off and discard the bottom ends of the asparagus so the spear will fit in the tart pan. Use a vegetable peeler to peel the bottom third or quarter of each spear (a pain, but worth it!). Set aside. Spread the cooked shallot over the par-baked crust. Top with an even layer of the grated cheese. Arrange the asparagus spears on top. Bake until the asparagus is tender and browned and the pastry is all well browned, about 30 minutes. Let the tart cool, cut into pieces, and serve warm or at room temperature. Like most things made from puff pastry, this tart is at its best if served while still warm. Sitting around and/or reheating won't ruin it, but they won't do it any favors either. This is not a great make-ahead item. The crust will get soggy and/or stale the day after cooking and the asparagus will take on a slightly gray rather than green color. 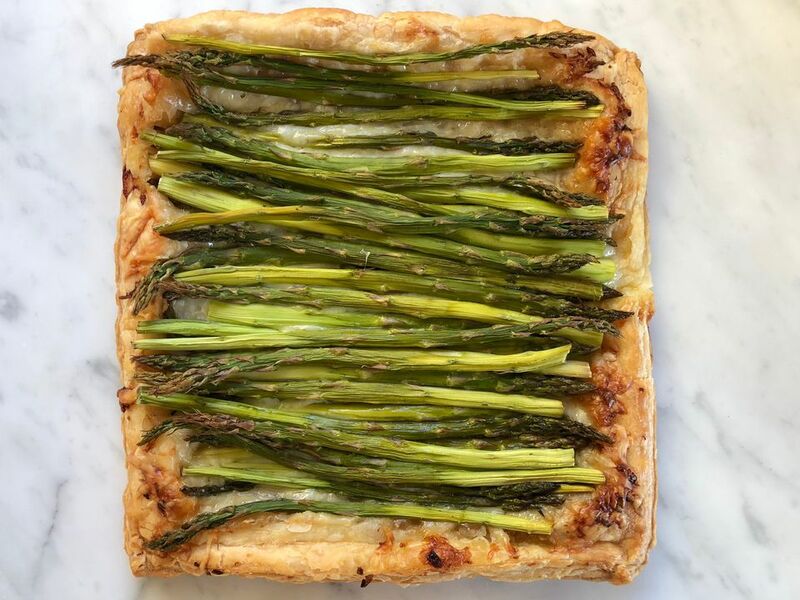 You can prep the asparagus and grate the cheese, the day before though, so that assembling and baking the tart can happen in a snap once the party starts. Use a different type of cheese: Comté, Gouda, and Fontina are all obvious choices, but a truffle, infused cheese, goat cheese, or even Brie are all going to lead to a delicious tart. Mix up the vegetable: Any vegetable that responds well to roasting quickly will be good here. Try another kind of crust: A pie crust, properly blind-baked, would be great here. Make your favorite, blind-bake it for 20 minutes, and sally forth!